Aspiring concept artists love the idea of making game art for money. But it’s hard to understand the concept art industry without an insider’s vantage point. 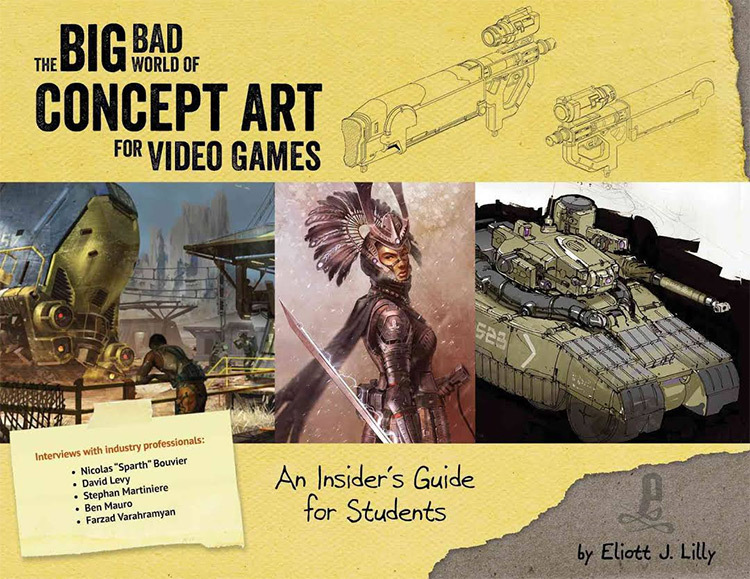 And that’s exactly what you get with Eliott Lilly’s Big Bad World of Concept Art for Video Games: An Insider’s Guide for Students. Over 144 pages this book covers everything from the basics of concept art to finding a great school and landing your first job. This is not a book that’ll sugarcoat the truth or hold your hand along the way. It’s brutal, and rightfully so. Concept art is a highly competitive industry and you need to be 100% dedicated to break in and make it a career. And if you’re serious about concept art then you’ll find everything you need in this book. This comes with 5 chapters each with different topics that progressively delve deeper into the industry. The intro chapter covers Eliott’s history in concept art and why he’s a valid author for this book. Here’s a quick breakdown of all the chapters. In chapters 1-2 you’ll learn about what concept art actually is. You’ll learn how artists work, what tools they use, what sort of tasks they’re given, and ultimately how to become a pro. There’s a very specific section titled “Am I cut out for this?” where Eliott covers everything expected of modern concept artists. I highly encourage you to read over this chapter many times and really think about your future. This can help you avoid the pain of following concept art only to realize the career is not what you initially thought. Eliott then delves into questions about college and schooling. There are two big sections here: the first covers college and professional schooling, the second talks about self-teaching and improving on your own without a teacher. Artists need to keep practicing and always try to improve. Stagnation is death in this industry. Every artist also needs to learn how to teach themselves so they can grow and improve on their own. This is made abundantly clear in chapter 3 which covers tips for life drawing, imaginative drawing, working from studies, and building a visual library. Chapters 4 and 5 have the real pro tips for artists who want to break in. Chapter 4 shares tips on how to organize a portfolio that’ll land you a job in the industry. Then in chapter 5 you get to read advice and interviews from real-world concept artists. These are all professionals with years of experience. Each artist gets 4-5 pages to share their thoughts and answer questions related to the field. The artists featured are Nicolas Bouvier(Sparth), David Levy, Stephan Martinier, Ben Mauro, and Farzad Varahramyan(can’t find his website sorry!). Also Eliott gives himself a few pages to share his journey and his advice for artists. In the last couple dozen pages you’ll find resources for aspiring concept artists. These include books, working materials, online courses, and other concept artists to check out. Big Bad World of Concept Art is undeniably the most comprehensive book with a start-to-finish approach to professional concept art. Getting into this career is about more than just painting cool stuff. It’s a real job in entertainment and you have to treat it that way to stay employed in the industry. Thankfully Eliott’s writing style is crystal clear and very pragmatic. You’ll get plenty of rhetoric but you’ll also get lots of techniques that you can apply to hopefully break into the concept art industry on your own. Also the pages are full of beautiful concept art to look at while reading. Aspiring professional artists of all ages don’t usually have a crystal clear goal in mind. This is true with college kids and post-college age artists who understand a little about concept art, but really don’t know how it all works. The Big Bad World of Concept Art for Video Games will force you back down to earth. You’ll learn from a professional artist about the nitty-gritty details of this industry and how it really works. This book offers a clear roadmap from start to finish. Everyone walks the path in a different way but anyone who “makes it” typically ends up in the same place. These tips are universal and will apply for decades to come. If anything the concept art industry is growing rapidly. There is still a very high demand for talented concept artists. Unfortunately everyone wants to become a concept artist so the supply is also very high. With Eliott’s advice you’ll learn to see the concept art career path without rose colored glasses. You’ll learn why it’s hard work and why there are no shortcuts. But if you put in the work you really can make it. This is true for high school & college kids but also true of artists in their late 20s or late 30s. Even if you never did art as a child you can always learn. But it takes serious effort no matter what. Eliott doesn’t show the industry as a hostile place or as a slave labor camp for the inexperienced. But he tells it like it is with real honesty. More artists need this kind of tough love because the industry will not coddle you into a job. That’s what you’ll really get from this book: A real-world perspective on concept art. By the end you’ll know exactly what you want and if you’re cut out for concept art as a career. Not everyone can do it. And it’s much better to learn early rather than mid-way through chasing your dream. If you realize that concept art is all you wanna do then the tips in this book will be invaluable to your success. You’ll learn how to study, how to keep learning, how to create a portfolio, and how to present yourself to land(and keep) a job in the industry. This is a must-read book for anyone that wants to become a concept artist. Eliott’s Big Bad World of Concept Art for Video Games offers a 360° view of the entire industry and shares secrets for breaking in. These aren’t well-guarded secrets but they are tips that most amatuer artists never get. Professionals don’t usually have time to share their advice, but Eliott goes all-out and even brings in 5 other professional artists to share their advice too. After reading this book you’ll have one of two reactions: either you’ll be more hesitant about this industry or you’ll be even more invigorated to chase a concept art career. Both reactions are valid and they’re both helpful to aspiring artists that want to find jobs in the entertainment industry. If deep inside you truly know you should be a concept artist then pick up a copy of this book. I guarantee you’ll find yourself re-reading it many times over and finding new advice every time.